Judith Whitman always believed in the kind of love that "picks you up in Akron and sets you down in Rio." Long ago, she once experienced that love. Willy Blunt was a carpenter with a dry wit and a steadfast sense of honor. Marrying him seemed like a natural thing to promise. But Willy Blunt was not a person you could pick up in Nebraska and transport to Stanford. When Judith left home, she didn't look back. Twenty years later, Judith's marriage is hazy with secrets. In her hand is what may be the phone number for the man who believed she meant it when she said she loved him. If she called, what would he say? 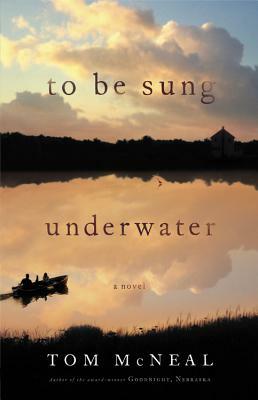 TO BE SUNG UNDERWATER is the epic love story of a woman trying to remember, and the man who could not even begin to forget. Tom McNeal was born in Santa Ana, California, where his father and grandfather raised oranges. He spent part of every summer at the Nebraska farm where his mother was born and raised, and after earning a BA in English at UC Berkeley and an MFA in Creative Writing at UC Irvine, he taught school in the town that was the inspiration for his first novel, Goodnight, Nebraska. Tom has been a Wallace Stegner Fellow and a Jones Lecturer at Stanford University, and his short stories have been widely anthologized.